SAN JUAN CAPISTRANO, Calif., – February 3, 2016– St. Margaret’s Episcopal School announces that four student-athletes from the Class of 2016 have committed to play intercollegiate lacrosse next year. Seniors Payton Fales, Nick Shanks and Erik Suh will continue their academic pursuits, as well as compete athletically at an impressive group of colleges and universities across the nation. Payton Fales, a member of the 2015 U.S. Lacrosse Southern Section Champion Tartan lacrosse team and two-time team captain, will compete at the NCAA Division III level, committing to Colby College in Waterville, Maine. Fales garnered 2015 All-Orange County and All-U.S. Lacrosse Southern Section Tournament awards as goaltender for St. Margaret’s. Payton, who ranks himself as “usually one of the top five funniest guys on the team,” was also named an Under Armour Underclassman Western All-American in 2015. 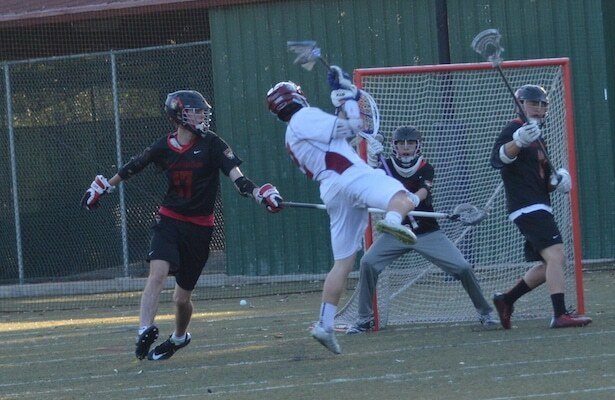 For his efforts to grow the game of lacrosse beyond the borders of the United States, Payton was named team captain for the 2015 U-19 Israel National Lacrosse Team. “I am continually impressed by Payton’s leadership and love of his teammates. It has been one of the most special things I’ve seen as a coach and I am looking forward to his senior year and beyond,” said Head Lacrosse Coach Glen Miles. Nick Shanks has committed to play lacrosse at NCAA Division III Tufts University in Medford, Mass. Shanks, a two-time All-CIF Southern Section honoree in football is a four-year varsity lacrosse letterman and two-time U.S. Lacrosse Southern Section Champion.Nick has volunteered at Father Serra’s Food Pantry and intends to major in business at Tufts. “Nick is an incredibly gifted athlete and has been a huge contributor to St. Margaret’s success on the football and lacrosse fields. Nick comes up big every time he steps on the field, and I am confident he will continue to do so at the next level,” said Coach Miles. Erik Suh has committed to play NCAA Division I lacrosse at St. John’s University in New York. Erik, a two-time U.S. Lacrosse Southern Section Champion, was named Co-MVP in the 2015 Championship game. Erik recently attained the rank of Eagle Scout, the highest level in Boy Scouts of America. Erik aims to major in finance at St. John’s. Samuel Harnisch, a member of the 2013 and 2015 U.S. Lacrosse Southern Section Championship Tartan lacrosse teams, has committed to play for the 2015 NCAA Division 1 Lacrosse National Champion University of Denver Pioneers. Samuel’s impressive pedigree includes being named a 2015 Under Armour Underclassman All-American and is currently ranked as the No. 71 high school senior in the country by recruitingrundown.com. Samuel will join his brother, Ryan Harnisch, Class of 2015, at the University of Denver. For the Tartans, Harnisch was named First Team, All-County Lacrosse in 2015. A two-sport athlete at St. Margaret’s, Samuel serves as team captain for the lacrosse and football teams and was an integral part of the 2014 CIF Southern Section Champion and CIF State runner-up Tartan football team. Samuel is also a leader off the field, devoting himself to helping the community through the Share Our Selves Ministry and Victory youth lacrosse programs. “Sam Harnisch is a tremendously gifted athlete, but what I am more impressed about is his leadership here at St. Margaret’s. His compassion for others and his ability to excel in the classroom and on the playing field is what sets him apart in my mind. I am very proud to be able to share this young man with the University of Denver,” said Head Football Coach Stephen Barbee. Founded in 1979, St. Margaret’s Episcopal School is a coeducational, independent, college-preparatory day school in Orange County serving 1,250 students in preschool through grade 12. Its mission is to educate the hearts and minds of young people for lives of learning, leadership and service. With nearly 2,000 alumni who have matriculated to colleges and universities across the country, St. Margaret’s is a vital member of the San Juan Capistrano community and educational landscape of Southern California.